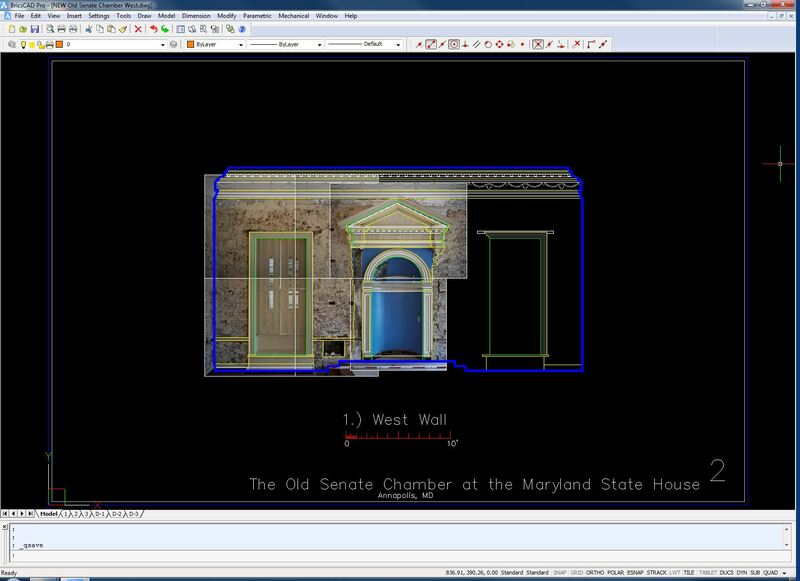 For my project at the the Old Town Hall in New Castle, DE, I am first establishing the existing conditions of masonry walls – including their deformation. This documentation will help us to choose where to set targets for monitoring over the coming months/years. 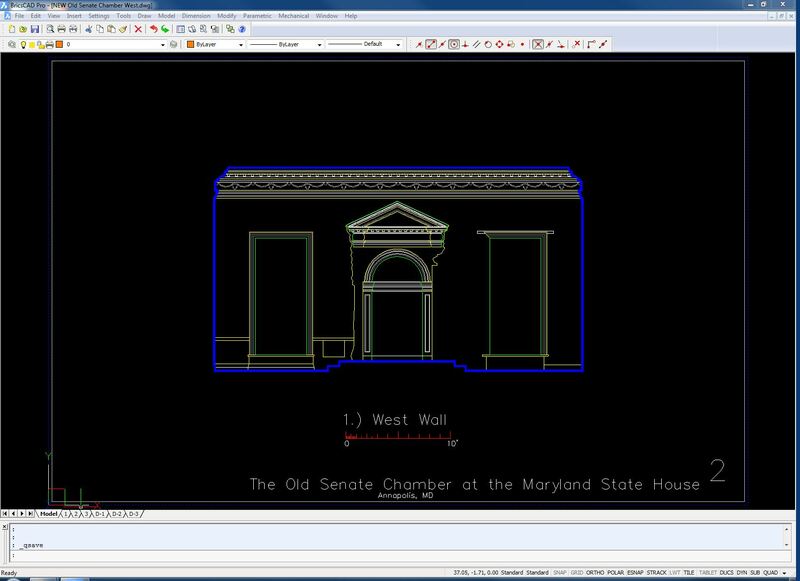 The image above ^ shows a screen capture of an accurate measured line drawing delineating the limits of the masonry surfaces and indicating the architectural features nearby. 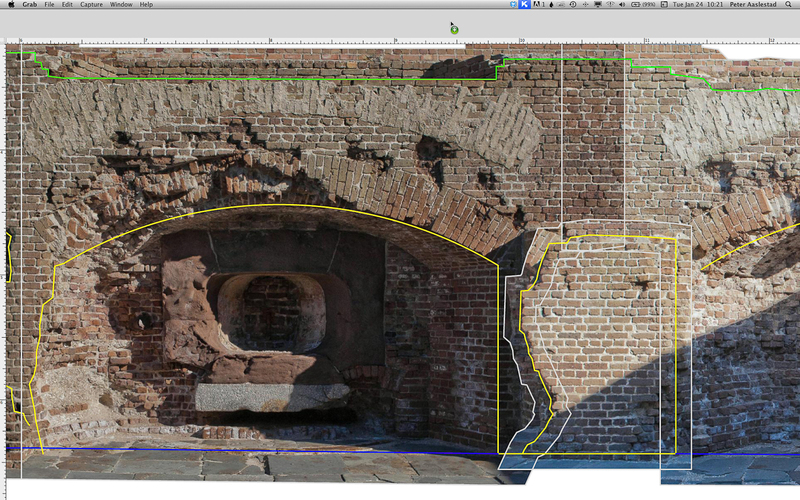 This image ^ shows a drawing layer “thawed” to display a sort of key plan to the different regions of masonry for which individual rectified photographs were prepared. The next few images show some of the drawing layers containing these rectified photographs “thawed” and you can get an idea of how the composite whole is constructed like a mosaic. When a single image is rectified so that the masonry portions of the image match the real world size and shape of what is being depicted, features that are NOT co planar can be distorted, not matching real world conditions. This is one reason a mosaic approach was needed to cover all of the surfaces in question accurately. So, in this approach, the line drawings carried the responsibility of delineating the wall’s size, shape and configuration of architectural elements while the rectified photos carried the responsibility of conveying the lay out and character of the masonry construction units. Today, I might approach the project differently, using a true “Orthophoto” of the sucrose instead of a mosaic. The distinction is important. An Orthophoto is a planar projection of a dense point cloud or textured mesh 3D model. I was unable to create these back in 2012 when I did this work – but today I can do so -still using photogrammetry- and maintain the same level of accuracy demanded by such work. 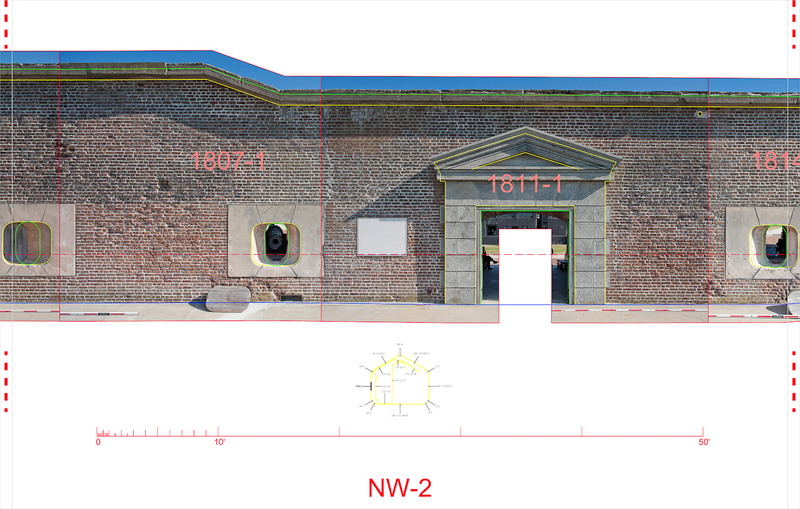 An Orthophoto (constructed from images from various points of view) depicts the masonry surfaces as well as the architectural detailing/millwork accurately. 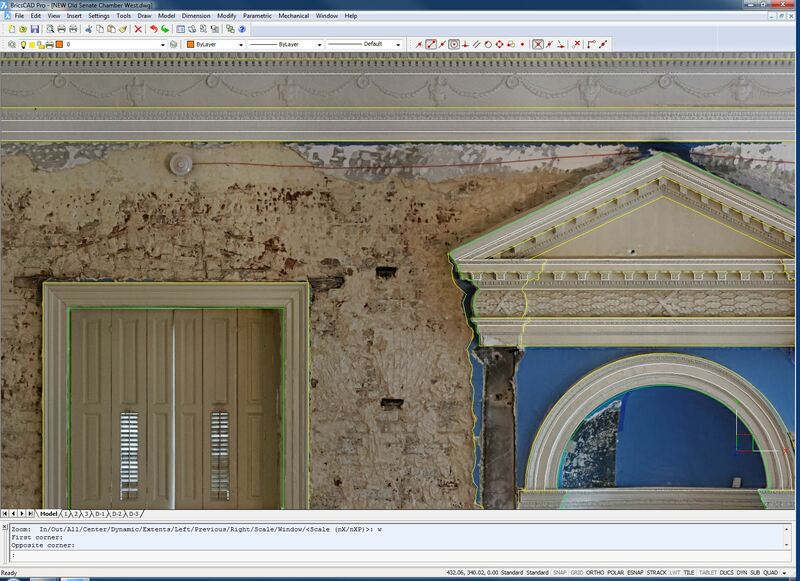 This image ^ shows the orthophoto seated nicely behind the measured line drawings. 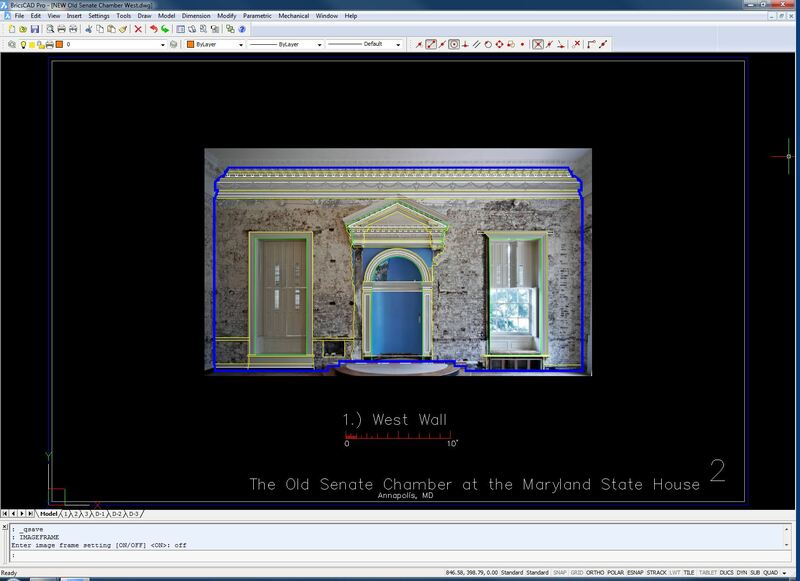 As mentioned above, it is a projection from a 3D model, which can be looked at from a variety of angles and manipulated in 3D modeling software . below is a video clip showing the model these surfaces. I am really excited to have this new set of tools at my disposal! The mosaic approach is still sound and may be more appropriate for some projects. In fact, the two approaches can coexist in the same set of documentation if needed. 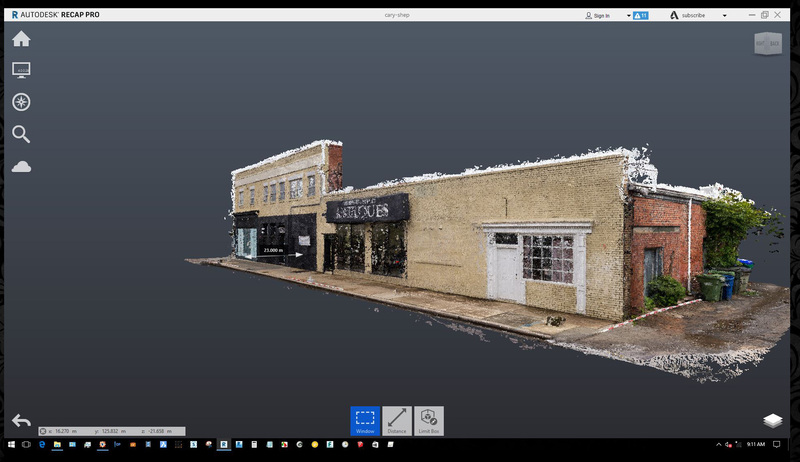 But the addition of 3D scanning and the creation of true Orthophotos to my toolbag will allow me to provide architects and engineers faced with complex preservation challenges with more options. 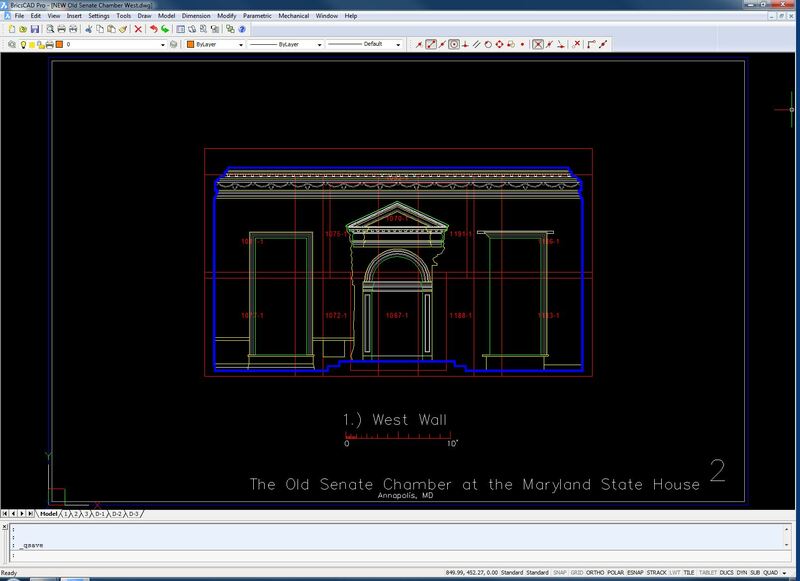 So finally work is underway to document this little gem of a statehouse from 1840. Below are three shots of my assistant raising the camera up on the telescoping tripod to gain important points of view for photogrammetric work on the building’s exterior. 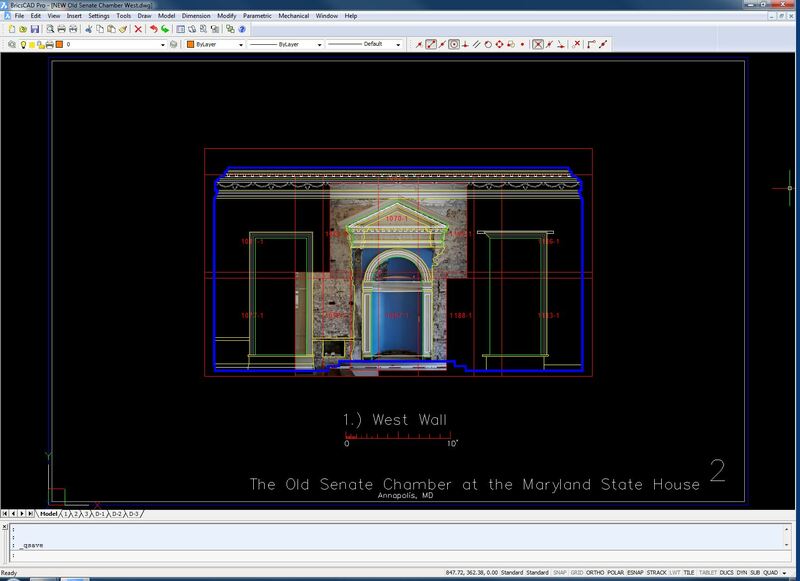 Above and below are screen shots (from AutoCAD) showing a group of rectified images assembled into model space depicting the existing conditions of one of three separate structures recently documented at Morven Park in Leesburg, VA.
For this project, the “drawings” are really a series of boundaries to rectified imagery organized onto different drawing layers. All of the rectified images shown have been desaturated in order to make them read more clearly. Color versions are also provided. After shooting a series of photographs of the old Southern stronghold in October I’ve just completed a set of forty seven tabloid size sheets that capture and represent the existing conditions of the exterior walls and courtyard elevations. 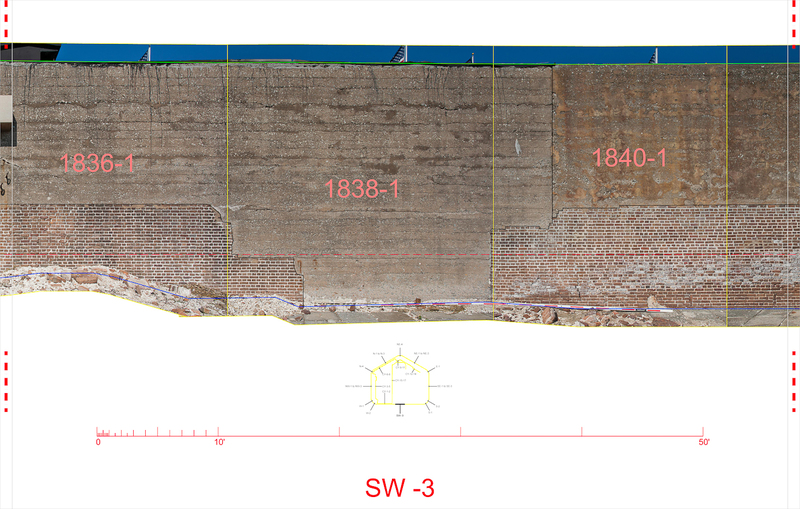 These will be used later in the year as the basis for a study that will clearly distinguish different periods of masonry and masonry infill in order to create a viable preservation plan. The drawings and rectified images (hybrid drawings) are laid out for plotting at the architectural scale of 1/4″=1′-0″ – but can be printed at larger scales if needed. An envelope plan is a delineation of the extent of a building’s mass taken at a fixed elevation. It establishes a precise limit to the outermost profile of the building. 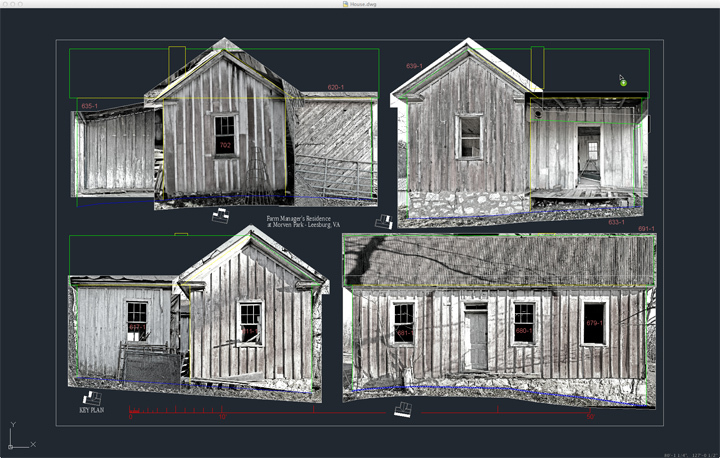 Envelope plans are easily derived from photogrammetric surveys and point clouds that decribe the exterior conditions of a building. The value of the envelope plan should not be overlooked. When charged with creating plan drawings of a building, the envelope plan is the first place to start. It provides a reliable framework against which any data from an interior survey can be compared – significantly reducing the occurrence of human error when constructing a detailed floor plan drawings depicting interior layouts. 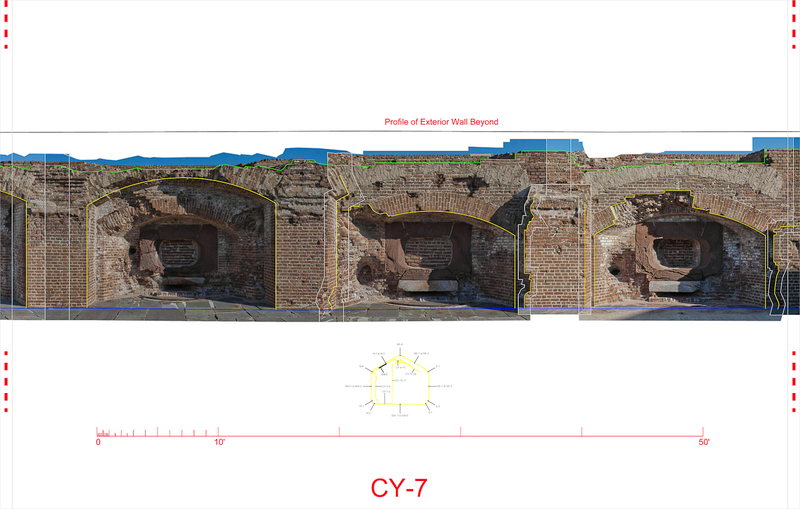 When possible, I use data from photogrammetry to prepare envelope plans before I go inside a structure to collect additional observations. By establishing accurate envelope conditions, previously mysterious internal conditions that might have been otherwise unmeasurable (such as wall thicknesses) can then be reliably calculated. An envelope plan is especially valuable for non orthogonal structures. For some projects when I am collaborating with a team of architects who are close by to a project site, I prepare the envelope plan using photogrammetry and then hand it off to my colleagues who will complete the drawing during subsequent visits to the building. It is a great way to eliminate questions that arise amid a wealth of (sometimes) confusing field notes and measurements. I’m posting a new header for this blog. It’s a composite image of half of the Quai Vauban facing the river Doubs in Besancon, France. It’s an accurate assembly of a couple dozen images that are each rectified to a known plane/scale. 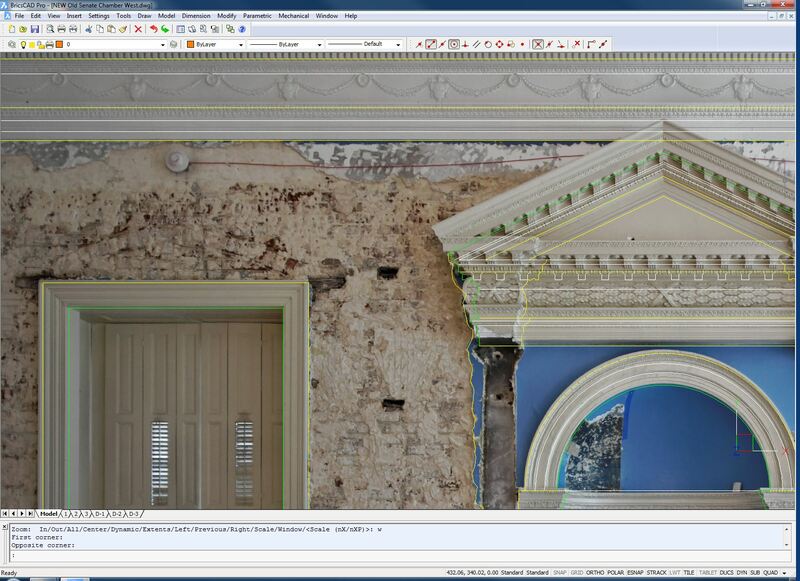 Here is a detail showing the resolution of the image. We are hoping to see this printed full size and used as a mural somewhere in Charlottesville – a sister city to Besancon. 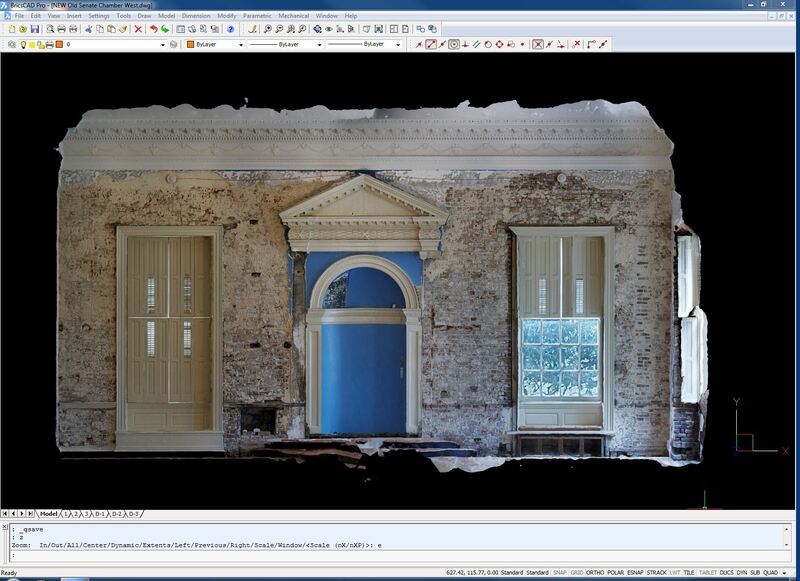 Here I am posting a composite elevation of a portion of the stone barn at Morven Park in Leesburg, VA. The “elevation” is actually a composite of three images, each rectified to respect the scale of 1:96 (or a quarter inch equals a foot) when printed at 300dpi. The individual images are posted below.